MTR to “Stealth Vertical”. It was nice that 20 meters was open again tonight, but when it seemed to feel ‘worked out’, I stumbled on down to 40 meters but didn’t hear a single Sprinter there. Must be time to turn off the radio and call the X-XYL? Thanks to those who pulled me out tonight. Best signal here tonight was WB5UDA. It was fun to return to the Sprint after not having Played in quite some time. Ran my KD1JV AT Sprint II on a gel cell, feeding a Norcal Doublet through my Elecraft T1 tuner and BL1 balun. The Norcal Doublet was supported at the top of my 20-ft telescoping fiberglass pole in my back yard, and I operated from my patio. What a beautiful night here in Colorado! Worked only 12 stations this evening (apologies to N6GA for butchering his callsign). Heard good signals on 20 but almost everyone on 40 was down in the mud. W1AW code practice was loud and clear on 40, though. This was the first operation for the Norcal Doublet, and I have to say I was pleased with its performance. Thanks everyone for a great evening! I had the "Sprite" (homebrew 20 meter SS rig) fired up to 1.2 watts into a CFZ at 40'. I had ordered a LiPO battery to keep the weight down, but it hadn't arrived, so an 8 cell AA alkaline pack was used. The battery weighs more than the xcvr (8 oz vs. 5 oz). Hope to see many of you next month with a 6 oz ( 0.375 lb) station! The bands were quite noisy here in MD. While activity seemed a little sparse, I was able to make a few QSOs on 20, 40, and 80 - and enjoyed the event. I ran an FT-817 at 2.5 watts to a 65 foot wire running out of a second story window. The antenna is pretty minimal . . . but I worked NK6A in California and OM5OA in the Slovak Republic. I tried 80 meters with it and worked AB1AV (Bill gave me a 539). Thanks guys for the QSOs. Ran KX3, at 5W to OCF Dipole, Paddlette and IPad with Pigtail. Breakdown by band: 1 on 10M (N1IX) 1 on 15M (N1IX), 8 on 20M (N4SX, NK6A, N1IX, WA8ZBT, K3RLL, NK9G, N5GW, WB5BKL) 2 on 40M (NQ2W, N1IX) and 1 on 80M (N1IX). Great 1 watt signals from N5GW and N4SX . . . very cool - you guys rock! As always, nice to get NK6A, the thrill of coast to coast QRP always has that big wow factor with me...thanks Don for hearing my signal! Rick, NK9G came booming in from WI . . . and always comforting to hear calls I'm familiar with. 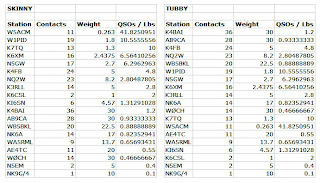 Thanks, N1IX, my neighbor and friend for the Qs on 10, 15, 20, 40 and 80 . . . that makes it an offical Worked 5 Band, Newton, NH . . . Other contacts were with WA8ZBT in TX, K3RLL in FL, WB5BKL in TX all on 20M. 40M had a lot of noise last night so I didn't hear anyone besides NQ2W on 40M. Many thanks to the Adventure Radio Society . . . these are great chances each month to try out different setups, rigs etc. This month I tried a new set up with the KX3, Paddelette, and Ipad and hand logging . . . I think it might be the set up I use for a couple outside QRP events later this year. This is the first Spartan Sprint for me in years. Great to work the regulars. I had the K1 packed away but pulled it out and enjoying it once more. Good to work the boys out in California. K6CSL, N6GA, NK6A and KA6GSC. I had a lot of fun. We will do it again! running 1W...FB. Thanks to WA4CHQ for sticking in there. We made it work! Doubles with only W9LR. Worked 3 NH SPers in row! Thanks to all. I hope to hear you all next month. Tried 20, 15 and a bit on 40. 20 Qs and 15 different states. Conditions what they were, I was surprised to work NH (three different stations) and NY. I heard many new stations on. I even made a QSO before the contest started. The first contest QSO was with NK6A and it went poorly. The paddles weren’t making good contact and I could barely get the exchange out. The second QSO didn’t happen because I couldn’t get them to send W3KC. I switched to the G4ZPY ones and did work W3KC. Next the KX1 reported that the 10 cell NiMH battery pack voltage was only 7 V. At that point I switched to Plan B, K2 and 7 AHr battery. After 13 Qs on 20 m, I moved to 40 m at 0201Z and got 4 Qs before a nearly half hour long dry spell when I got WA8PGE with 2 minutes to spare. Two band contacts were with KC7PM in UT, NK9G in WI, and WA8PGE in OH. It was a good evening for being out in the woods and on the radio. On the way home, I ran the truck heater for a short while. I suspect that not many others needed a heater after the Spartan Sprint. K3/10 @ 5W to a wire delta loop, a dipole or a 40M extended double Zepp. Not much heard this time - all QSOs except 3 were on 20 M. Worked NQ2W, WA8MTI and NK9G again on 40M. Removed two QRO QSOs from my total. No contacts on 15 or 80M. Lost of familiar calls missing in my log - hope it was just poor conditions My thanks to all. Had fun. I used my battery powered KX3 and laptop computer. Most of the activity was centered around the QRP frequency on 20 meters. Forty meters was very noisy here. I was only able to hear KQ2W in NY. The only station worked on multiple bands was Ann, K1QO. K4SX and N5GW both had very nice signals using just one watt. It was great to work both Don, NK6A and Rod, W7OM on the left coast. 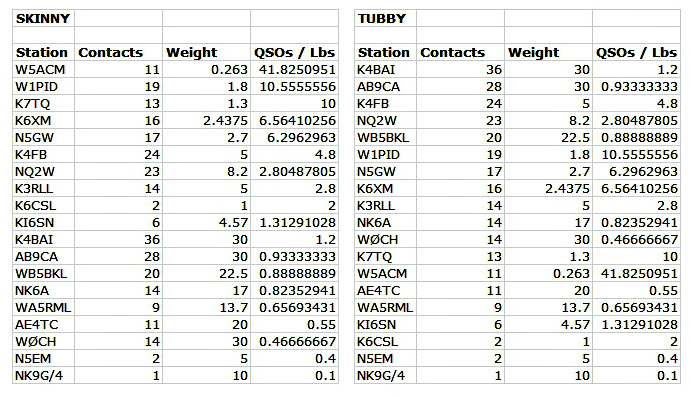 Other stations worked were WA8ZBT, WB5BKL, and WB5PG in Texas. Also, K3RLL in FL and Rick, NK9G in WI. I will try to stay awake for the entire sprint in July. Electraft KX3 @ 5 watts, running on internal batteries. PAR Endfedz 10/20/40 dipole slung into backyard tree. Operated from roofdeck on garage.